Why choose Sky Collision Repair Monroe for your auto body repair? If you’ve been in an accident and need a professional auto body repair shop, Sky Collision repair Monroe Ga. is the best choice. We are I-CAR certified. We offer a free estimate, lifetime guarantee and direct billing to insurance. We’ll even provide assistance with your car rental! Despite the small population of Monroe, i.e. fewer than 15,000 citizens, car accidents do occur frequently. We, at Sky Collision Repair Monroe, believes that people in small cities like Monroe are at a disadvantage when it comes to automobile maintenance and repair. You might be paying through the nose for minor repair jobs. However, you don’t need to worry, as we can help you with collision repair in Monroe. The extent of the damage your car suffers depends on the severity of the collision. For instance, the damage might be limited to the bumper falling off, but sometimes, your car’s entire frame might be battered and disfigured. 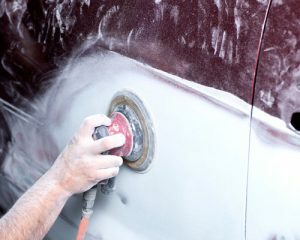 Regardless of the extent of the damage, we can restore the appearance of your car and ensure that it looks good as new. Our professionals specialize in paintless denting. As you would know, denting is a job that requires precision and meticulousness, and that’s exactly what we offer. With our paintless denting services, you can rest assured your car retains its value after the repair services are done. From minor dents to complete frame disfigurements, from bumps on metal to cracks on the windshield, we can complete any repair job. Come to us no matter how bad the damage looks. With our professional repairs, we can make your vehicle look new again. We understand cars, car repairs and to some extent, how car owners think. We know your car’s value matters to you, and that is why we offer paintless dent removal. We will fix the dents without causing damage to the original finish of your car, ensuring your car retains its value. Whether you are a pickup enthusiast or a vintage car lover, we welcome you all with open arms. Big vehicle, small vehicle, four-wheel drive, all-wheel drive, coupe, crossover, sedan, hatchback, and what not. If your car has a dent, bump, body damage, paint damage, missing bumper, or broken windshield, we will fix it. In our line of work, experience counts for a lot, and that’s what we bring to the table. We have been around for 30 years serving our fellow Monroe residents. We have three decades of experience to back up everything we say. We go the extra mile to offer you an unparalleled experience. You will love to talk to one of our trained professionals, whether on the phone or face to face. We can even pick up your car and bring it to our location if you are located within a 25-mile radius. Your satisfaction is what we strive for, and we take every step necessary to make sure you don’t face any hassle. So, what are you waiting for? Call us right now at (770) 266-2824 to discuss your car repair needs or quicken the process by using our online collision repair estimate form here. If you’ve been in an accident and need a professional auto body repair shop, Sky Collision repair in Monroe Ga. is the best choice. We are I-CAR certified. We offer a free estimate, lifetime guarantee and direct billing to insurance. We’ll even provide assistance with your car rental!